To Cite: Torabi-Nami M, Nasehi M, Razavi S, Zarrindast M R. Aversive Memory, Anxiety-Related Behaviors, and Serum Neurochemical Levels in a Rat Model of Labored Sleep Loss, Shiraz E-Med J. 2014 ; 15(3):e22358. doi: 10.17795/semj22358. Background: Sleep deprivation (SD) is emerging as a hot topic due to its health concerns. There are compelling reasons for a tremendous interest in neuroscience of sleep in recent years. Objectives: We aimed to evaluate how total sleep deprivation (TSD) and chronic partial sleep restriction (CPSR) might affect memory, anxiety-related behaviors, and the serum level of neurochemical markers such as brain-derived neurotrophic factor (BDNF) and corticosterone in a rat model. Materials and Methods: The disk-over-water (DOW) apparatus was employed to induce TSD and CPSR in male Wistar rats. The six study arms were as follows: cage control, 48 hours; cage control, seven days; DOW control, 48 hours; DOW control, seven days, TSD, and CPSR. Elevated plus-maze (EPM) was used to measure parameters (percentage of OAT, percentage of OAE, and locomotor activity) corresponding to anxiety and aversive memory. To measure serum BDNF and corticosterone levels using the ELISA method, blood samples were drawn from all rats on the fourth day at 5 P.M. Results: Our results demonstrated that TSD (P < 0.001) and CPSR (P < 0.001) induce memory impairment while exert anxiolytic-like effects in comparison with controls. Data showed that CPSR causes more memory impairment and anxiolytic-like effect in comparison to TSD (P < 0.001).These interventions however, did not alter the locomotor activity. Serum corticosterone level raised dramatically in CPSR rats in comparison to TSD and controls. Although the difference in serum BDNF level between TSD and CPSR arms was insignificant, it was markedly decreased in comparison to corresponding controls (P < 0.001). Conclusions: Our findings suggest the more pronounced effect of CPSR rather than TSD in impairing aversive memory and reducing anxiety. Decreased BDNF and peaked corticosterone level in TSD and CPSR suggest the probable inﬂammatory processes involved in possible insults to the brain caused by SD. Sleep deprivation (SD) is emerging as a hot topic due to its health concerns. There are compelling reasons for a tremendous interest in neuroscience of sleep in recent years. The magnitude of effects of inefficient sleep on health, productivity, personal and public safety, general wellbeing, and the quality of life has compounded over the past two decades. It is pertinent to address this issue, as sleep loss results in reduced alertness and attention as well as learning and memory impairment (1). As a component of cognitive functions, memory is believed to play a critical role in personal life and social interactions; thus, its impairment as a cost of total or chronically partial SD in today competitive life should be taken into consideration. Studies on SD in animals bring along insights regarding the possible deleterious effects of inefficient sleep in human. For instance, in shift workers and those who fail to catch up with their sufficient sleep demands, sleep-dependent cognitive deficits such as impaired memory consolidation arise (2). In a comprehensive review (3), the role of sleep and impact of SD on consolidation of declarative and non-declarative memory and how memory consolidation is facilitated during sleep have been discussed. Moreover, the imposed changes, which prevent maintaining circadian rhythmicity due to shift-work, may lead to functional deterioration of internal systems such as the circadian clock. This is shown to be linked to the pathophysiological underpinnings of age-associated decline in cognitive functions and neurodegenerative disorders. Potential underlying molecular mechanisms for the abovementioned problems might include brain metabolism, reactive oxygen species homeostasis, and hormone secretion (4). The memory deficit seen in sleep-deprived animals (5-7) has suggested the distinctive function of sleep in memory consolidation (8). A number of previous studies, which have used inhibitory avoidance task (5, 9), Morris water-maze (6), and contextual fear conditioning (7) tests, suggested a marked SD-induced memory deficit. Furthermore, the effect of SD on synaptic plasticity and memory function has been deeply discussed in a recent report (10). The current study was designed to assess the effect of total sleep deprivation (TSD) and chronic partial sleep restriction (CPSR) on memory and anxiety-related behaviors in rat model. To examine the post-SD memory and anxiety state at the same time, we used the elevated plus-maze (EPM), one of the behavioral assessment tasks used for this purpose. EPM test/retest protocol is introduced as a favorable method to simultaneously investigate anxiety and the process of aversive learning and memory (11-14). The use of EPM in testing anxiety is based on the natural tendency of animals to avoid dangerous situation when they face height and open spaces (15). 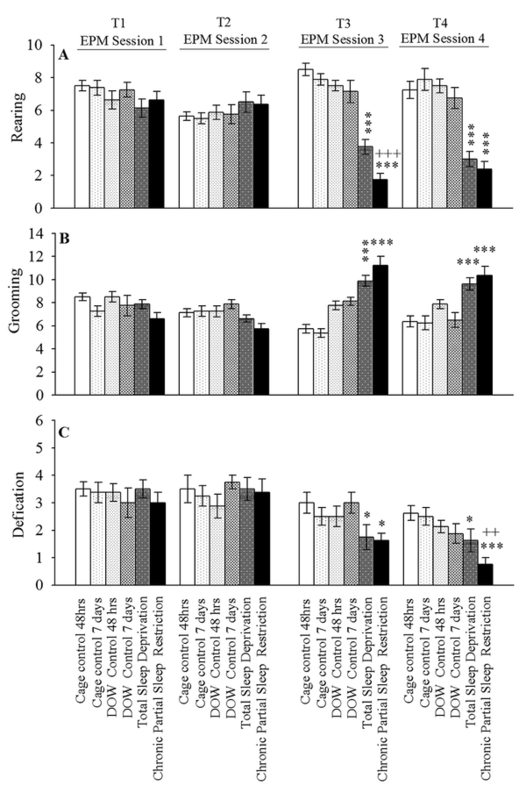 The undesired context of EPM (ie, height and open space) induces an innate aversive reaction translated to anxiety-related behaviors in animals (16). Findings during EPM behavioral assessments are also related to emotion because the behaviors exhibited on test arise from a conflict between the motivation to explore the maze and the natural tendency to avoid the undesired situation (17). Animals acquire information with regard to safe and dangerous areas of the maze upon test. The EPM retests (usually performed in 24 hours) induce experience-dependent behavioral changes and represent an index for aversive memory acquisition, consolidation, and retention. When rodents are exposed to a retest session, their open arm time exploration reduces, which pertains to the presence of their aversive learning and memory (18). We hypothesized that CPSR can more adversely affect memory function in comparison to TSD. Cognitive impairments can be seen following a chronic and continued exposure to an oxidative stress such as sleep loss. Some evidence have supported the SD-induced oxidative stress to the brain (19, 20); however, the challenging question that should be addressed through molecular and genetic approaches is “how are sleep duration, sleep fragmentation, oxidative stress, and aging related?” It must determine whether the correlation between SD and neurodegenerative processes is indeed a causal one, and if it is, which mechanisms are involved. It has been shown that memory impairments are related to the excessive production of proinflammatory cytokines such as tumor necrosis factor alpha (TNF-α), which is observed in distinct pathological conditions, namely, neurodegenerative diseases (21). Decreased serum brain-derived neurotrophic factor (BDNF) is also evident in Alzheimer’s disease. This bioelement plays its role in preventing neurodegeneration, thus, tends to decline in exposure to chronic oxidative stress conditions (21, 22). With regard to SD, we hypothesized that the decreased BDNF may reflect either enhanced neuronal demand for BDNF or its declined production due to the inflammatory processes following SD. Hence, we measured serum BDNF to correlatively observe its changes upon SD-induced memory impairment. Furthermore, since corticosterone, as the rodents stress hormone, was suggested to suppress the BDNF expression at the mRNA and protein level (23, 24), we measured corticosterone as well. What made the present investigation novel was the concurrent assessment of memory and anxiety-related behaviors in both TSD and CPSR conditions. Few animal studies had used a comparative experimental SD paradigms to model TSD and CPSR and none, to our knowledge, had concurrently looked at the effects of labored sleep loss on memory together with anxiety. Moreover, it had not been previously assessed simultaneously with serum BDNF and corticosterone levels in sleep-deprived rodents. The aim of the current study was to examine memory, anxiety-related behavior, and serum levels of BDNF and corticosterone in rats with experimental TSD and CPSR in comparison to controls. Bred male albino Wistar rats in the Neuroscience Lab Animal-House of the Institute for Cognitive Science Studies (ICSS, Tehran, Iran), with 220 to 270 gr weight on the first examination day, were used. In each cage, four rats were kept in a room with a 12 hours light/dark cycle and controlled temperature (22℃ ± 2℃). They had access to food and water ad libitum and were allowed to adapt to the laboratory conditions for at least one week prior to the first day of EPM test (T1). Each rat was handled about three minutes each day prior to behavioral testing. All EPM experiments on rats were performed between 13:00 and 17:00. Each control or experimental study arm was comprised of eight rats. The study arms were as follow: arm one, cage control,48 hours (no SD, 48 hours); arm two, cage control, seven days (no SD, seven days); arm three, disk-over-water (DOW) apparatus control, 48 hours (in off apparatus with no SD, 48 hours); arm four, DOW apparatus control, seven days (in off apparatus with no SD, seven days); arm five, TSD (for 48 hours), and arm six, CPSR (seven consecutive days, 12 hours/24 hours sleep deprived). For TSD, the DOW was continuously rotating for 48 hours and for CPSR, an automatically-set timer allowed the apparatus to be 12 hours on (08:00 to 20:00) and 12 hours off (20:00 to 08:00) intermittently for seven consecutive days (Figure 1 and 2). Figure 1. Modified Disk-Over-Water Apparatus Used to Induce Sleep Deprivation in Rats; Adapted From Everson et al. Study (25). This carousel-like device, composed of a rotating plate and two shallow water containers, was placed underneath. The two rats were separated by Plexiglas cages. Animals had to keep pace with the rotating disk to avoid being sunk in water. Experimental rats were either placed on the slowly spinning plate for 48 hours (TSD) or seven consecutive days with 12 hours on and 12 hours off (CPSR). The latter condition not only partially deprived rats from sleep but also reversed their sleep/wake cycle. The DOW control animals were housed in off apparatus for 48 hours or seven consecutive days. The apparatus was fabricated by Borj-e-San’at, Tehran, Iran. This diagram depicts the six study arms: four control and two experimental arms. T1 and T2 were baseline EPM sessions. Following T2, animals were stratified as either controls (housed in cages or off apparatus for 48 hours or seven days) or interventions. The corresponding controls for TSD rats (arm 5) were arm one and three. Likewise, the corresponding controls for CPSR (arm 6) rats were arm two and four. Abbreviations: TSD, total sleep deprivation; and CPSR, chronic partial sleep restriction. The specific ethical concern about the extent of imposed sleep loss by a device like DOW was addressed in compliance with guidelines for the care and use of mammals in neuroscience and behavioral research (2003), the Institute for Laboratory Animal Research (ILAR),USA. To refine DOW method and make it least possible cruel and invasive, guideline measures were meticulously observed. Based on this and referring to the local guidelines for animal care and use, the study was approved by the Ethics Committee of the Institute for Cognitive Science Studies. We used a carousel-like device, known as DOW apparatus (25, 26). This apparatus was used to induce TSD and CPSR in experimental rats (Figure 1). The apparatus housed two rats in separate Plexiglas cages, which shared a round disk as a partially elevated floor. Instead of the yolk controls, we used DOW controls (ie, animals placed in off apparatus). Beneath the disk floor were 6-cm deep trays that were filled with shallow water. The water temperature was maintained at 31℃ ± 2℃ throughout the experiments. This relatively higher than normal temperature let animals adjust with the well-defined thermoregulatory and imposed metabolic syndrome by labored sleep loss (26). In DOW method, when the rotating plate spins at slow rate (4 rpm), rats should keep pace when moving on the plate to avoid sinking in shallow water. The apparatus would let the experimental rats to obtain only 10% to 15% of their total amount of needed sleep during 24 hours (25, 26). 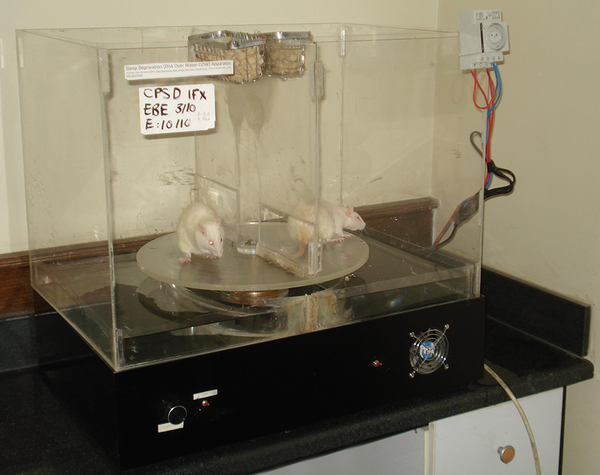 We used the DOW apparatus housing two experimental rats for either TSD or CPSR models. Close observation (randomly ten to 20 blocks, each for ten minutes) as well as camera surveillance was considered to ensure their actively and safely movement on the spinning plate or in water. Both animals were modeled as experimental subjects of the classical DOW setup. Using the valid DOW setup (13-15), the experimental rats were expected to be effectively (at least 85% to 90%) deprived from their sleep. The DOW control rats were housed in off apparatus. When in apparatus, food (standard laboratory chow) and water were provided ad libitum and rats were closely monitored for their physical wellbeing and tolerance. Lighting schedule of the environment was compliant with the standard L/D cycle, similar to the control condition. Our EPM was made of black Plexiglas (floor and walls) and consisted of two opposite open-arms (50 cm × 10 cm) surrounded by a 1-cm high ledge and two closed-arms (50 × 10 × 40 cm3) set up 50 cm above the floor. The junction area of the four arms (central platform) was measured at 10 cm × 10 cm (25, 27). The EPM method was used to examine memory and anxiety-related behaviors in test/retest fashion as outlined previously. One hour prior to the test, rats were left undisturbed in the testing room so that they could adapt to the testing environment. Then they were individually placed on the initial part of the open arm of the maze facing the center and allowed for five-minute free exploration. Experiments were under a low illumination (50-lux) condition, over the diurnal phase between 13:00 and 17:00. The five-minute EPM sessions were recorded by a video camera while a monitor and a digital recording system were installed next door. The observer, who quietly sat one meter behind one of the closed arms of the maze using chronometers, measured the time spent in the open arms, the time spent in the closed arms, and the number of entries into open and closed arms. Entries were considered only when all four paws were in the arms. Behaviors like rearing (taking erected posture by rat), grooming (rubbing face including ears, mouth, vibrissae, and eyes with rapid circular movements of forepaws), and defecation (the number of boli defecation) were further assessed upon reviewing the recordings. The maze was cleaned with distilled water after each EPM session. The recorded raw data were used to calculate the open arm time percentage (OAT%) which is percentage of time each rat spends in the open arms to the total amount of time spent in any arm (open/total × 100). Open arm entries percentage (OAE%) was recorded as a correlate for aversive memory upon EPM retest. In fact, the primary indices of EPM anxiety, which comprise spatiotemporal measures of open arm avoidance (% of entries to the open arm and spent time in it) upon test, were taken as avoidance memory indices during retest (17, 28). The sum of all open and closed arm entries was used as an index for general locomotor activity (Figure 3). The number of rearing, grooming, and defecation were manually recorded as conventional indices for anxiety-like behaviors (29, 30). The rearing, grooming, and defecation data analysis is summarized in Figure 4. Rats were stratified into six groups. Corresponding controls for group five (TSD) were group one (cage control, 48 hours) and group three (DOW control, 48 hours). Corresponding controls for group six rats (CPSR) were groups two and four. After the first two EPM sessions (T1 and T2, 24 hours apart), experimental rats either experienced 48 hours of TSD or CPSR. Control rats remained either in cage (groups one and two) or in off apparatus (groups three and four) for 48 hours or seven consecutive days, respectively. Afterwards, T3 and T4 EPM sessions (24 hours apart) were done. Data are shown as mean ± SEM for eight rats per group; ***, P < 0.001 different from corresponding controls; and +++, P < 0.001 different from total sleep deprivation group. After completion of the fourth EPM session (T4), all rats (experimental and controls) were sacrificed according to the guidelines using chloroform. Immediately, 3 mL of blood was obtained through cardiac puncture and centrifuged (the abovementioned process was done between 17:00 and 18:00). Serum was isolated and stored at -20℃ in EDTA tubes. Serum BDNF and corticosterone levels were measured using sandwich ELISA (Enzyme-Linked Immunosorbent Assay) method. The monoclonal Anti-BDNF antibody 1B10 (Sigma-Aldrich Inc.) and Rat Corticosterone ELISA Kit 96T (BIOTANG Inc.) were used in our biochemical assessments. OAT%, OAE%, locomotion, rearing, grooming, and defecation were assessed in four consecutive EPM sessions (T1-T4). T1 and T2 (24 hours apart) were baseline EPM assessments after which interventions were made. These interventions were cage-control or DOW-control conditions for 48 hours and seven days duration as well as TSD and CPSR for 48 hours and seven days, respectively. The third and fourth EPM sessions (T3 and T4) were done postintervention. Again, these sessions were 24 hours apart. The experimental design is illustrated in Figure 2. Since EPM is quite sensitive to experimental manipulations, a consistent context (including same environment, illumination, handling method, etc) is an important factor to avoid unwanted effects on anxiety and memory (31, 32). To avoid bias due to the repeated EPM protocol, we considered all possibly contributing factors consistent throughout preintervention and postintervention EPM testing sessions. The rationales to have consecutive EPM testing (T1-T4) were as follows: (a) to have a baseline measurement of animals' anxiety (T1) and aversive memory (T2) before any interventions; and (b) to compare post-SD anxiety level (T3) and memory function (T4) to the baseline condition. 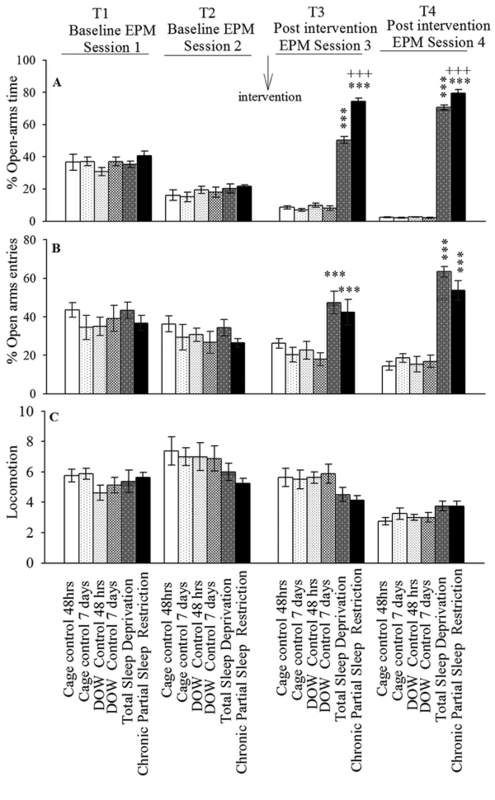 Furthermore, the EPM indices of experimental animal groups were compared to their corresponding controls. Following the T4 EPM session and on the same day, blood was drawn from animals (between 17:00 h and 18:00 h) in all groups to measure the BDNF and corticosterone levels of subjects. Given the normality of distribution and homogeneity of variance, to evaluate the obtained behavioral tests data (ie, EPM measures such as OAT%, OAE%, locomotion, rearing, grooming, and defecation) during the four consecutive EPM sessions (T1-T4), we employed the repeated measure analysis of variance. Where Mauchly’s test revealed no significance (P > 0.05), the “sphericity assumed” was applied. In case of significance in P value (P < 0.05), Greenhouse-Geisser test was performed. Furthermore, one-way ANOVA was used to analyze serum neurochemical data. For this dataset, upon significant F-value, post-hoc analysis (Tukey’s test) was performed. The comparative data between TSD and CPSR experimental groups and their controls were presented as mean ± SEM. Differences with P < 0.05 between groups were considered statistically significant. The effect of TSD, CPSR, and control conditions on OAE behaviors is shown in Figure 3 (Experiment 1). Repeated measure analysis of variance declared that there was no significant difference in all parameters amongst different arms in T1 and T2. Furthermore, based on Mauchly’s and Greenhouse-Geisser test, TSD and CPSR increased OAT%, OAE%, and the number of grooming while had no effect on the locomotor activity. These interventions led to a notably decreased number of rearing and defecations in T3 EPM sessions. This was compared with corresponding control conditions. Increased OAT% and OAE% in T3 EPM session indicated the anxiolytic-like response induced by TSD and CPSR; however, this effect was more pronounced in CPSR than in TSD rats (P < 0.001). Using the same statistical methods, the analysis revealed that OAT% and OAE% were increased in T4 session in TSD and CPSR rats. The increase in OAT% was more evident in CPSR than in TSD (P < 0.001). During T4 EPM study, behavioral assessments showed that TSD and CPSR do not alter locomotor activity while decreased the number of rearing and defecations in comparison to corresponding controls. Taken together, the increased OAT% and OAE% (during T4) could be interpreted as impairment of aversive memory consolidation and retrieval following TSD and CPSR. The quantitative outcome of the statistical analysis on this experiment dataset is summarized in Table 1.
a Data correspond to the open-arms exploratory behaviors in baseline (T1 and T2) and postintervention (T3 and T4) consecutive EPM sessions. 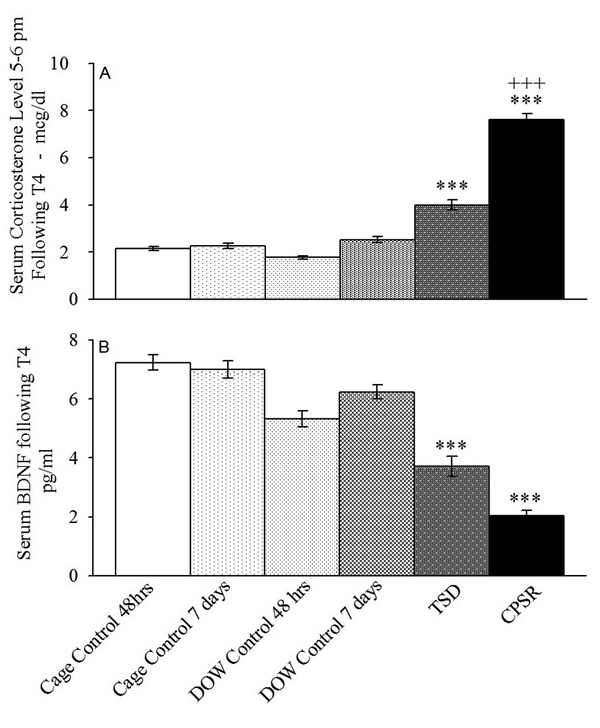 The experiment two results indicated that although serum corticosterone did not differ among control groups, it was dramatically raised in TSD and CPSR rats in comparison to their corresponding controls (F[5,42] = 90.85, P < 0.001) (Figure 5). The serum corticosterone levels (Mean ± SEM) in μg/dL were 2.14 ± 0.08 in arm one (cage control, 48 hours), 2.25 ± 0.11 in arm two (cage control, seven days), 1.76 ± 0.07 in arm three (DOW control, 48hours), 2.51 ± 0.11 in arm four (DOW control, seven days), 4.03 ± 0.2 in arm five (TSD), and 7.61 ± 0.26 in arm six (CPSR). CPSR resulted in higher serum corticosterone level than TSD did (P < 0.001). ELISA test using the Rat Corticosterone ELISA Kit 96T and monoclonal Anti–BDNF antibody-1B10 were employed to measure serum corticosterone and BDNF levels, respectively, in control and experimental animals (TSD and CPSR). Blood was drawn between 17:00 and 18:30 on the day of T4 EPM session. Data are shown as mean ± SEM for eight rats per group; ***, P < 0.001 different from the corresponding control groups; +++, P < 0.001 different from TSD group; BDNF, brain-derived neurotrophic factor; and pg/mL: picogram per milliliter. Our results also revealed that that serum BDNF was significantly reduced in TSD and CPSR in comparison to controls (F [5, 42] = 22.23, P < 0.001) (Figure 5A); however, the difference between TSD and CPSR was not significant (P = 0.076). The serum BDNF levels (mean ± SEM) in pg/mL were 6.86 ± 0.46, 6.5 ± 1.23, 6.18 ± 1.49, 6.36 ± 1.16, 3.78 ± 1.31, and 2.14 ± 0.88 in arms one to six, respectively (Figure 5B). Prior to, during, and after interventions, the TSD or CPSR experimental rats were closely observed for their safety and sanitation as well as to record their possible physical condition findings. Although food intake of experimental animals was comparable to their corresponding controls, sleep-deprived rats had by roughly 16% to 22% weight loss in comparison to their baseline condition (F [5, 42] = 69.64, P < 0.001) (Table 2). The typical appearance of sleep-deprived rats (scrawny appearance and disheveled with patchy loss of trunk furs) and postintervention presence of lesions (on tails and paws) were consistent with earlier investigation findings (25, 26). These are summarized in Table 2.
aabbreviations: CC, cage control; DOW-C, disk-over-water control; TSD, total sleep deprivation; CPSR, chronic partial sleep restriction; and EPM, elevated plus-maze. All experimental animals were meticulously observed for their physical wellbeing and tolerance throughout interventions. Close observation of the control and experimental rats physical condition revealed 16.8% to 26.44% weight loss in sleep deprived rats while 5.92% to 9.01% weight gain in controls. Under controlled condition for food and water, with relatively same amount of food intake in control and experimental animals, weight loss occurred in sleep-deprived groups (more evidently in CPSR rats). There was a typical appearance of sleep-deprived rats, which was consistent with earlier investigations. There was no apparent cause for the observed lesions in experimental animals’ tails and paws. The two rats, which unexpectedly died during the experiments, were replaced by intact rats for which data were recaptured from T1. According to our results, TSD and CPSR induced anxiolytic-like behaviors, which were more prominent in CPSR. The anxiolytic effect of interventions, which extended during T4, suggested an impaired aversive memory acquisition in experimental animals. These retest data (T4) proposed that the administered TDS and CPRS were possibly associated with impaired learning during test session. The interventions resulted in increased serum corticosterone and decreased BDNF level. For corticosterone, this increase was more pronounced in CPSR rats. The present data demonstrated that labored sleep loss in total and chronic partial forms in rat model causes memory impairment. In line with our results, there are considerable amount of experimental evidence denoting that memory functions could be negatively influenced by sleep loss. These impairments were evident in inhibitory avoidance and conditioned fear (5, 7, 33, 34), place learning and spatial memory (6, 35), trace conditioned memory (36), working memory (37) and state-dependent memory (38). A recent study has clearly reported the crucial role of sleep in fear-cued memory consolidation (33). Sleep plays a pivotal role in learning and memory processes (2, 3). Therefore, SD may affect the subsequent learning capacity and the ability to form new memories (3). The effect of sleep loss on synaptic plasticity and memory function has been deeply articulated in a recent report (10). Furthermore, sleep loss is shown to result in memory deficits, particularly in hippocampus-dependent tasks (37). This is proposed to be at least partly due to the SD-resultant oxidative stress and meanwhile, is attributed to excessive corticosteroid levels, arguably, and the depression-like symptoms. SD is shown to considerably reduce the hippocampal antioxidant markers including glutathione, catalase, and superoxide dismutase (20, 39), which negatively affect synaptic plasticity (20). On cellular level, sleep loss is shown to deleteriously affect synaptic plasticity (10, 37). The hippocampal long-term potentiation deficit results in short-term and long-term memory impairments (10, 37). Our results indicated that even partially, the chronic exposure to this oxidative stress (CPSR) might drastically affect memory function. We tested the aversive-associated memory by EPM; however, other types of memory tests with various methods have similarly shown post-SD memory impairments (5-7, 34-38). Although in rat model of SD, TSD and CPSR induced a broad spectrum of cognitive, behavioral, and cellular changes, short-term sleep loss (six hours) is reported to trigger compensatory mechanisms (eg, increased antioxidant responses) that prevent initial deterioration in working memory (39). Taken together, TSD and CPSR can potentially result in considerable impairment in memory function and the learning process. Further research is needed to test the cellular and molecular hypotheses regarding the mechanisms involved in the abovementioned process. To the best of our knowledge, there was no study that had addressed the influence of SD on the memory impairments and the anxiety state simultaneously. Our results indicated that when testing the exploratory behavior of experimental rats in EPM after SD (T3), TSD and CPSR could induce immediate anxiolytic-like effects. Despite the increased grooming, which could be due to increased release of histamine and endogenous peptide and the environment per se, the increased OAT% and decreased rearing and defecation support the anxiolytic-like effects of the interventions. Our data indicated that TSD and to a greater extent CPSR, induced anxiolytic-like effect. This is in contrary to some reports showing that multiple platform method-induced SD was anxiogenic that might be due to the induced-oxidative damage in the brain (40, 41); however, our results replicated and extended findings of Tartar et al. indicating that 24 hours of treadmill-induced TSD increases exploratory behavior in an open-field test of anxiety (OAT%) in comparison to cage or exercise controls (42). Therefore, it is plausible that the anxiolytic-like effect of SD, which might be due to the method we used for SD induction, made the animals exercise while being sleep deprived. A recent report has shown that the regular treadmill exercise regimen in rats prevents the SD-associated decline in BDNF expression in CA1 (hippocampus) (43). Moreover, it has been proposed that the antioxidant and anxiolytic-like effect of exercise may ameliorate the stress-induced damages to the brain (44). On the other hand, TSD could increase serotonin concentrations in different areas of the brain including hippocampus (45). Behavioral tests have also shown the antidepressant effects of TSD in animal models (46). The antidepressant effect of SD is, however, not believed to be related to the associated anxiolytic-like process (47). In addition, abovementioned effects may partly be attributed to the release of endogenous peptides in response to stress following SD (48). In our biochemical assessments, results showed the increased serum corticosterone in SD groups in comparison to controls. This suggested that the observed increased exploration in the sleep-deprived rats was not primarily due to a hypothalamic-pituitary-adrenal stress response. Serum and salivary cortisol were shown to be increased in animal and human subjected to SD (42, 49, 50); however, this cannot be explained by the possible anxiolytic-like effect, which SD might induce. In our experiment, the increase in corticosterone level was more pronounced in CPSR. In this experimental group, circadian rhythm was reversed (ie, rats were forced to stay awake during the day and compensate their sleep debt at night) and serum corticosterone as a circadian hormone was notably affected. What we examined and interpreted as anxiolytic-like effect of SD was seen after the third EPM session (T3); however, serum corticosterone was checked after T4. This might arguably indicate that the immediate anxiolytic-like effect might be eliminated and turned to long-term anxiogenic-like effects. Further research is required to support this hypothesis. Earlier findings have reported that TSD and CPSR can decrease the activity of the antioxidant enzyme, ie, superoxide dismutase, in the brainstem and hippocampus (20). Based on this, it was hypothesized that these conditions, which activate the reactive oxygen species, can trigger cascade of events that facilitate the release of proinflammatory factors such as TNF-α and interleukins (IL-1 and IL-6) in different brain areas including the hippocampal region. These are shown to attenuate the secretion of BDNF, which is a neuroprotective factor (9, 20, 22). Based on the established positive correlation between the circulating BDNF level and its secretion in various brain regions (51), we measured the serum BDNF. Even though the cause of this positive correlation is not clearly known, our data might partly elucidate the contribution of peripheral and central BDNF changes in possible brain insults following sleep loss. Our results showed decreased BDNF in post-TSD and CPSR conditions in comparison with controls. Hippocampal BDNF plays a critical role in synaptic plasticity, hippocampal long-term potentiation and consequently, memory function (9, 10, 21, 22, 52). There are reports indicating that after SD, BDNF secretion and consequently, its concentration are diminished in some areas of the brain including brain stem, hippocampus, and cerebellum (52, 53). This suggests that sleep plays an important role in secretion of BDNF. Due to the BDNF contribution to learning and memory processes, SD is perceived to affect memory function negatively. This is in line with what we found in our behavioral and neurochemical approach. Nevertheless, the association between BDNF, corticosterone, and the impaired memory caused by SD needs to be addressed more thoroughly in further studies. Similar to many investigations, our work faced some limitations. Firstly, we drew blood sample once (following T4); however, taking separate blood samples for corticosterone and BDNF following respectively T3(upon testing anxiety) and T4 (upon testing aversive memory) could have yielded more specific results. Secondly, ethical issue was a major concern and the necessity of assuring general wellbeing of animals and the relatively harsh situation per se, made evaluating the effects of longer durations for TSD or CPSR impossible. Thirdly, memory and anxiety levels could be measured following longer periods post-SD. finally, the possible behavioral differences between sexes when experiencing SD is an important issue. Future studies, which include both sexes, are needed to elaborate on these differences. In conclusion, our results, along with the insights from earlier research, further suggested the cardinal role of sleep in learning, memory function, and anxiety state. Decreased BDNF and increased corticosterone can be cues to further investigate whether and how inflammatory biomarkers (eg, interleukins, TNF-α, and interferon gamma) can possibly trigger neurodegenerative processes following acute or chronic SD. The authors would like to thank ICSS and the department of neuroscience, school of Advanced Medical Science and Technologies, Shiraz University of Medical Sciences for valuable contributions to this work.